There are so many different shapes, sizes, and ingredients to pasta these days. 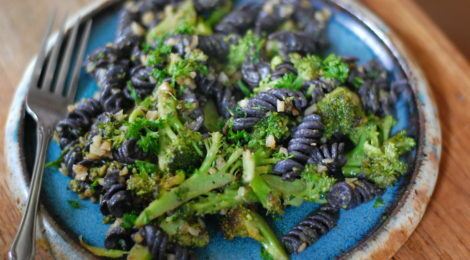 From spirals to spaghetti, traditional to grain-free, there is a type of pasta for everyone, and I am loving the options. As a kid, I was never crazy about traditional pasta, but I know of so many kids that are. Is it the texture, the shape, or is it purely used as a vehicle for holding excessive amounts of butter and/or sauce? Either way, when we are finding more and more people sensitive to grains and gluten, having options and trusting the ingredients in this food is a relief for parents everywhere. Now we can cook our kids favorite recipes (hello grain-free mac n’ cheese), and feel good about feeding it to them. When I saw pasta made out of beans at the store, I was really excited! A whole new food group to explore. Because these are purely made out of black beans (thank you Trader Joe’s) we can appreciate that this “side” is filled with protein, and no excess filler. Simply add some veggies and you are all set for a complete meal. This recipe, though perhaps not TOO kid friendly, is most definitely a treat for adults. Loaded with garlic and nutritional yeast, you really can’t go wrong here. Just boil the noodles, sautée the vegetables, season appropriately, finish off with zesty lemon, and you have a very satisfying lunch or dinner. This will take you about 15 minutes to make, and can be reinvented in so many ways for both the adults and kids to enjoy. Bring about 4 cups of water (or more depending on how much you are making) to a boil in a pot. Follow directions to cook black bean noodles. Be sure to rinse with cool water after they are done. Set aside. Melt butter or add olive oil to sautée pan over medium heat. Add chopped broccoli and sautée for about 7 minutes or until it is almost fully cooked, mixing frequently. In the last few minutes of cook time, add garlic to pan with broccoli, along with a splash of water and cover. Allow to “steam” for a couple minutes. Remove lid and mix well. 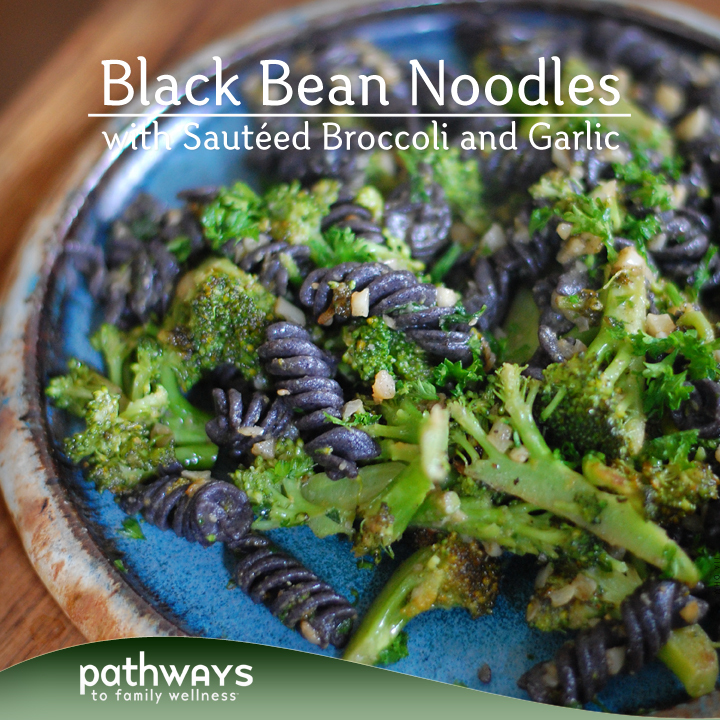 Add your cooked black bean noodles. Season with nutritional yeast, parsley, salt, and pepper and cook for another couple minutes. Turn off heat, add lemon juice, mix and serve.